One 2016 social media marketing report found that of the brands on Instagram, 51% are business to consumer (B2C) while only 33% are business to business (B2B). In the example above, Department of Brewology sells directly to customers online and sometimes through wholesale accounts. They showcase their prints being used in their customers’ homes and shops. If you sell your products or services directly to customers, whether it’s online or in-store, Instagram could be an ideal platform for you. Of the best-performing posts on Instagram, 65% of them feature products and 29% feature a brand ambassador or influencer. New Zealand shoe company Allbirds uses fun backgrounds to introduce new products. Their customers are equally as into creating imaginative photos that feature their shoes. The visual and interactive nature of Instagram’s platform is suited for product-based businesses. The first part of putting your sales strategy together is to identify the metrics. Your goal is to increase your sales, but you’ll want to assemble several metrics to help you determine that you’re on the right track. Sales: Keep track of your overall sales. Referrals: Web analytics tools like Google Analytics will help you note down what your current referral rate for Instagram to your website is. Conversions: The same web analytics tools, if paired with your store, will also display how many of those visitors purchased a product. Product or landing pages: If your product or service is more high-end, sometimes your initial sales goal is only to have customers click to the product page. Check out this post to learn more about how to calculate your social media ROI. The second step in selling on Instagram is creating a profile that is intentionally for sales. This includes having clear information in your bio, a direct link to your store and a profile photo that is on-brand. Handmade Sam*Made clearly states her work and products in her bio. She also includes contact information for inquires and an Instagram-specific landing page. Investing in either a high-quality camera or a photographer is important if you’re trying to make your images stand out from the rest of the feed. But all the above aside, creative photos still win for grabbing your audience’s attention. When testing out new content, you can use our Instagram analytics report to find out which posts performed best. 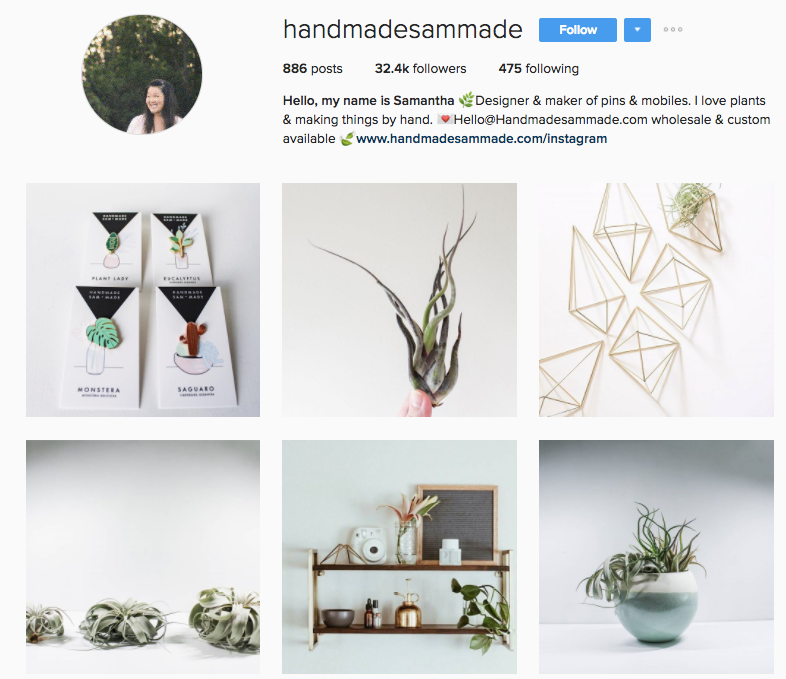 There are multiple strategies for increasing sales through Instagram. We sorted through a variety of brands on Instagram to bring you some inspired tips. Homepolish is a service-based business, connecting aspiring home decorators to interior designers. 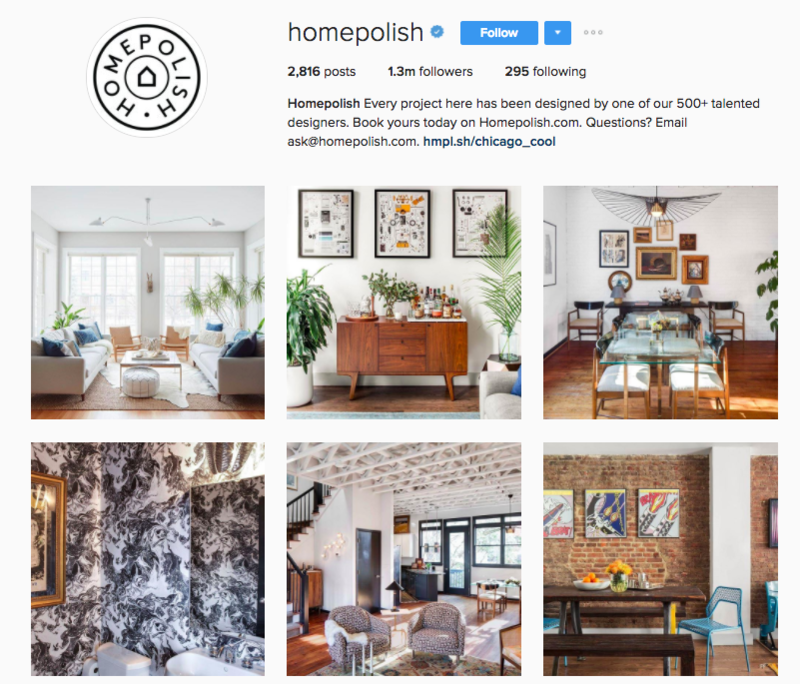 The company uses its Instagram account to showcase their designers’ work and oftentimes links to specific blog posts for certain photos. The above photo caption directs users to visit the link in their profile, which leads them to the blog post. The perk here is that customers who are intrigued or interested in learning more have the ability to do that. Just like when you use bit.ly or other custom shortlinks for Twitter, you can do the same for Instagram. Instagram does not hyperlink in captions, so the workaround is to direct people to the link in your profile. With Sprout Social’s integration with Bit.ly, you also have the ability to check important data on your shortlinks used in social media posts. We even give you the chance to shorten links directly from our compose window to avoid the back and forth between sites. For companies that sell products, you can use another paid service to track the products in your Instagram feed. Some of these companies include Have2Have.It, Linkin.bio and LIKEtoKNOW.it. This tactic is not just for companies. 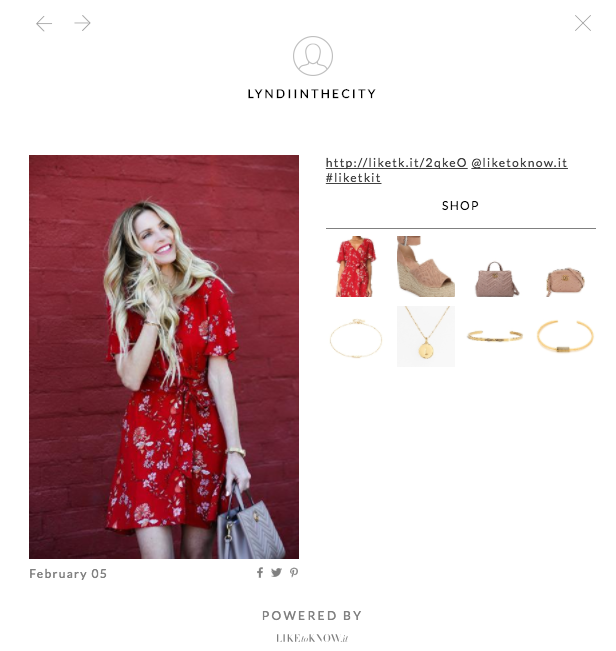 It also works well for fashion bloggers like Lyndi Kennedy. Lyndi uses LIKEtoKNOW.it in her posts. The above post is connected to the below landing page, making it useful for fans to know the products. On a related note, Instagram is currently working on shoppable posts. It’s a new feature that’s being tested on a select number of retailers. Instead of the standard stark-white background found in many product photos, opt for photos that showcase objects in a lifestyle photo. For example, if your product is a drink, show someone enjoying the drink rather than taking a photo of the can. 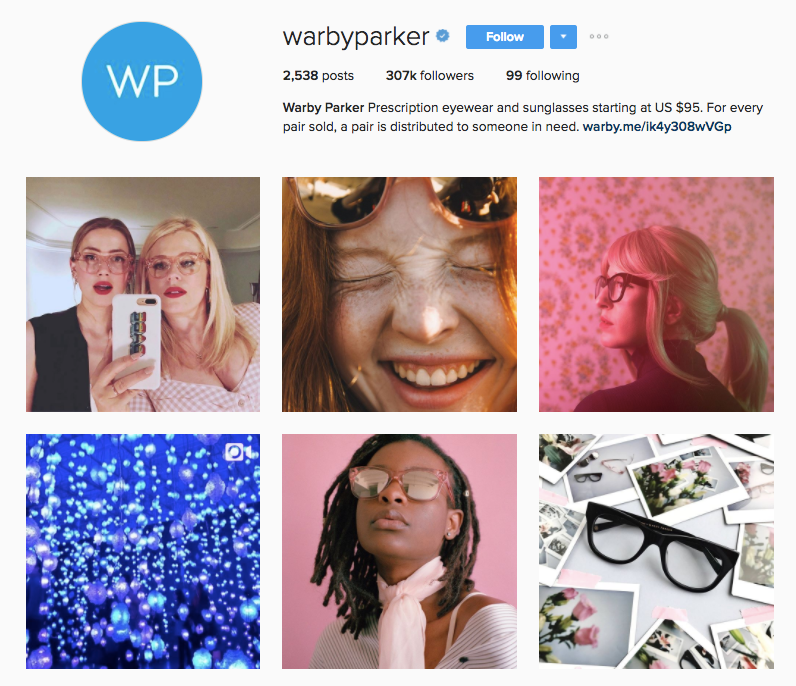 Warby Parker is an excellent example of a lifestyle brand. In their Instagram feed, you’ll see photos of their products, but you’ll also run across posts that reflect their fun and colorful personality. Various Keytags is a simple company. It creates custom keytags for the everyday person. Their Instagram feed is a portfolio, showcasing creative keytags that their customers have come up with. In between their customers’ photos, they also like to inject their own quirky sense of humor. This particular sales tactic helps you recognize your customers while still keeping your brand voice intact. Learn more about how to integrate user-generated content in your social media strategy. To keep track of your customers’ photos, encourage a branded hashtag. This is especially helpful for businesses who only sell online. Passion Planner’s customers like to be creative with their planners. The company showcases the most inspiring ones in their posts, which then leads to creating an Instagram community filled with your biggest fans. In the above post, Passion Planner starts off with a #PLANNERTIP and ends it with several a few branded hashtags. 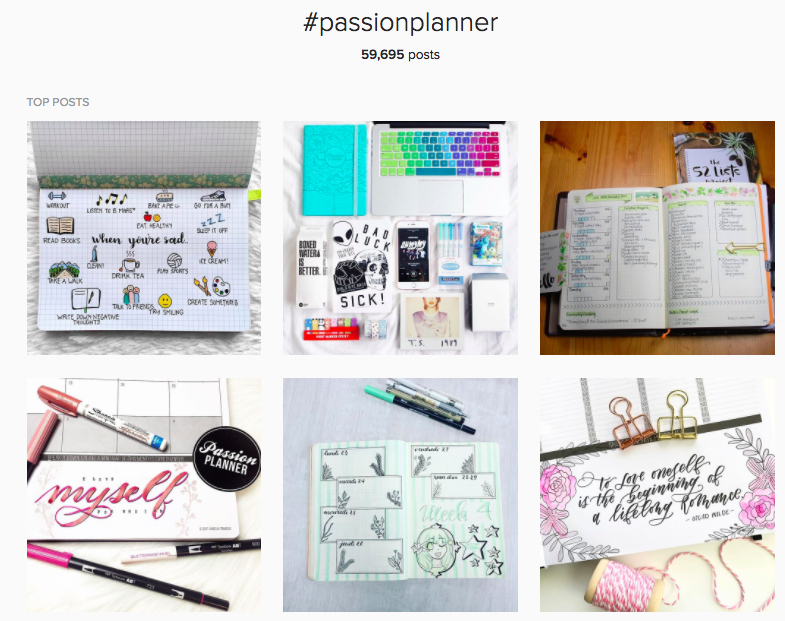 The #passionplanner hashtag alone boasts nearly 60,000 posts. Once you have a solid Instagram community, your sales will begin to reflect the social numbers. 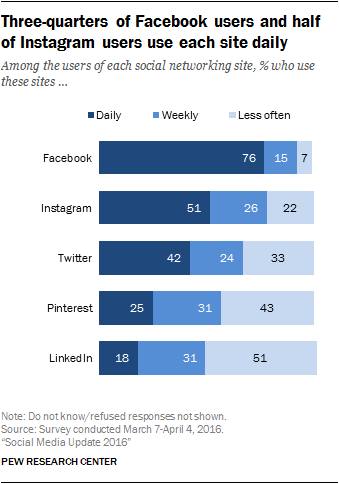 For a number of companies, like restaurants or high-end retailers, Instagram is used as a tool to expand their brand’s visibility. The below examples are from brands who use Instagram for exposure. There are a variety of tactics you can take toward selling on Instagram no matter what your products or services might entail. The best approach is to first decide on your sales metrics, then set your profile up for sales and finally create sales-worthy content.